Learn powerful tools to create what you want in your life. Life is too precious to just ponder. It is time to live your dreams. 20 hours of pertinent information, exercises, meditations and practical applications. Up to 8 hours of innovative step-by-step training on CDs. 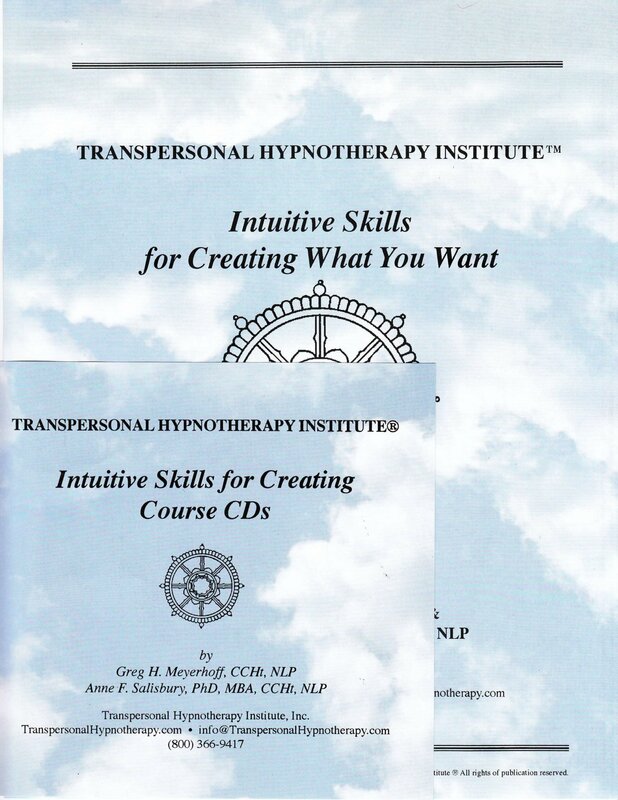 The “Intuitive Skills for Creating Workbook.” Follow along in the workbook as you listen to the CDs. The “Intuitive Skills for Creating” certificate of completion suitable for framing. The professional title of “Intuitive Skills Practitioner” which can be used in your promotional materials. Creating, Clean Out Debris Meditation, What Do You Want to Create? Demonstration. What Do You Want to Create? Demonstration (cont. ), Clean Out Meditation, Creating Discussion. Review of Class One, Clean Out Meditation, Discussion of Progress, Who Do You Need To Be? Demonstration. Who Do You Need To Be? Discussion, The Path Demonstration and Discussion. Clean Out Meditation and Review, Review Path Demonstration and Discussion, Ask Your Higher Self Demonstration and Discussion. Ask Your Higher Self Discussion (cont. ), Accept Yourself Demonstration and Discussion. Clean Out Meditation, Review and Discussion, Crystal Ball Demonstration and Discussion, Body As Compass Demonstration and Discussion. Body As Compass Discussion (cont. ), Hitting the Target Demonstration and Discussion, Hitting the Target in Your Dreams, Stepping Stones Demonstration and Discussion. “Anne and Greg have taught me great tools. I closed my biggest account thus far after taking this course. I am able to create my own version of heaven on earth. Yea!